When God Is Big And We Are Small: The Journey Continues . . . . The old adage, “Hindsight is 20/20”, is certainly true when it comes to the way God works in our lives. When my husband and I took off on our camping adventure seven weeks ago, we felt like a couple of kids cutting school. For years we had talked about taking off to explore the places we never got to because of time constraints. With my husband’s retirement, we realized that the time had finally come. With our new smallish camper in tow, we were as giddy as newlyweds out on a lark. Little did we know how God would deepen our faith through seemingly unrelated lessons. “Hush. Stop striving to understand what is far larger than you can comprehend. Hush . . . be still. KNOW that I am with you and in the coming days will carry you. This isn’t the end of the story. Reminders of lost loved ones suddenly taken . . . . Looking back, we can see how God had been preparing us weeks before in our travels. We had noticed them before we left–little “shrines” along roadways marking where someone was killed in an accident. Typically a simple cross with a name on it; at other times flowers, teddy bears, and other personal reminders are placed as a memorial. 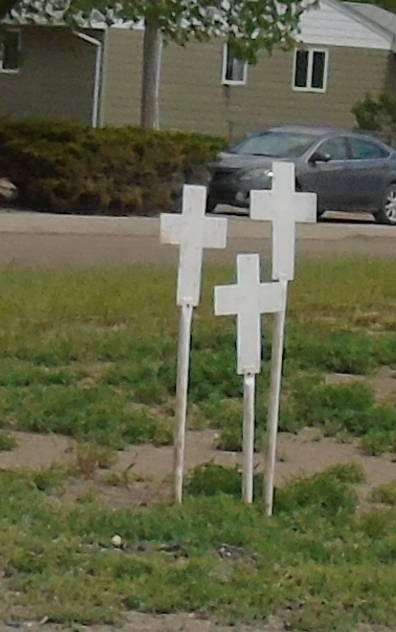 Our awareness grew as we traveled through Montana, where the State marks every life lost on its roads with a small white cross. We began watching for them as we drove and were stunned when more than one cross marked a scene. In this age of “political correctness” we wondered how long the practice of using a “religious” symbol would be allowed to continue. Looking back, it was then that what had been “a lark” became a journey within a journey. It was as if the roads we traveled on, “scenic” or ordinary, became grim reminders of loss. When we received the news about Josh and then Heath, we remembered those crosses. They were with us, full of life one moment . . . and then suddenly . . . they were gone. when we are stung by such painful loss? For us, the biggest thing has been to remember that God is Big and we are small. Submit yourselves, then, to God. purify your hearts, you double-minded. Change your laughter to mourning and your joy to gloom. Since leaving Montana, we’ve driven through eleven more states. In that time God’s incomprehensible enormity has been demonstrated in countless ways. 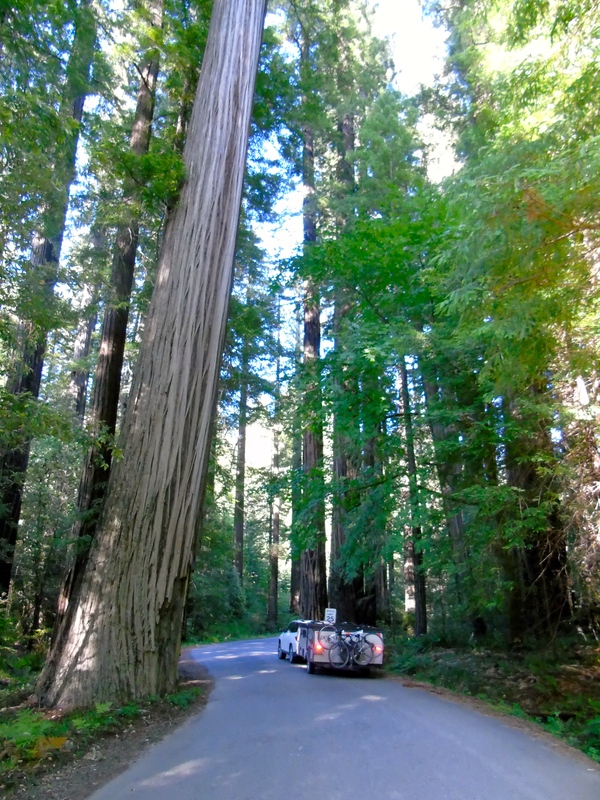 The day after receiving the devastating news, we watched whales basking in God’s Provision off Patrick’s Point and then appreciated the solitude of three days camping in the Avenue of the Redwoods–where God was indeed big and we . . . were tenderly cared for. After that, visits with long missed family and friends ministered greatly to our hearts. for those who are in Christ. For His faithfulness in loving us–even in our doubts. For ministering to us–as we have been privileged to witness the enormity and ever-changing diversity of His Creation. For Josh and Heath’s lives–and the assurance that they are safe with Him . . . .
doubt recedes as we find HOPE and SHELTER in HIM. ‹ PreviousGod Is . . . .
Next ›She Was Brave . . . . Thanks, Kathy. The scriptures truly minister. So looking forward to hear of your journey. What a moving testimony of the depth of God’s riches in the midst of human sorrow.